Stress response of Gulf of Mexico black coral to oil and dispersant. 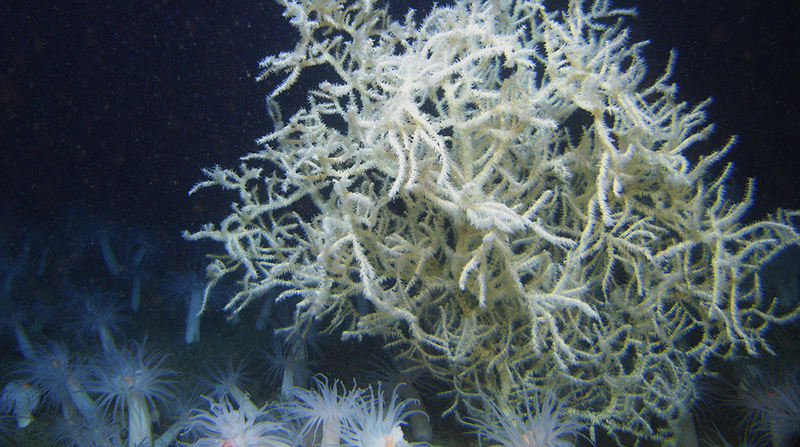 Leiopathes glaberrima - the deep sea black coral species used in this study. Photo courtesy of NOAA. After the Deepwater Horizon accident in 2010, where 4.4 million barrels of oil and 2 million gallons of Corexit dispersant were put into the Gulf, it became apparent that there was a lack of baseline information on the vulnerability of deep sea communities and a lack of knowledge about the impact of this type of incident. Prior investigations into the impacts of oil and dispersant have only focused on concentrations that result in impacts to the organisms that are visible. This recent study by ECOGIG researchers working at Penn State focuses on using sublethal concentrations that present a visual impact but the researchers also looked at the changes in gene expression (turning on genes related to stress) of the deep water black coral species Leiopathes glaberrima - they used both a white and red color morph of this particular species. This particular coral is a common coral species that acts as an ecosystem engineer (any organism that creates, modifies or maintains a habitat) in the region. The researchers hypothesized that dispersed oil would be the more detrimental treatment to coral health and this would be detectable in the coral's gene expression, even at sublethal concentrations. It was found that the corals used in this study showed visible signs of stress and health deterioration in response to oil and dispersed oil. They also showed changes in their gene expression, which occurred prior to any visible health impacts. The particular gene expression changes were related to immune response, wound healing and oxidative stress, all of which have been previously associated with coral stress. The researchers found that red color morphs of this species had more gene expression than the white, and the white color morph colonies deteriorated faster at higher oil concentrations than the red. Overall this study found that corals with the ability to vigorously change their gene expressions in response to an environmental stressor may have a higher stress tolerance. The stress response for these corals was strongest in response to dispersed oil - in this treatment corals had twice the gene expression compared to other treatments. To read the entire study, you can find the paper online here.